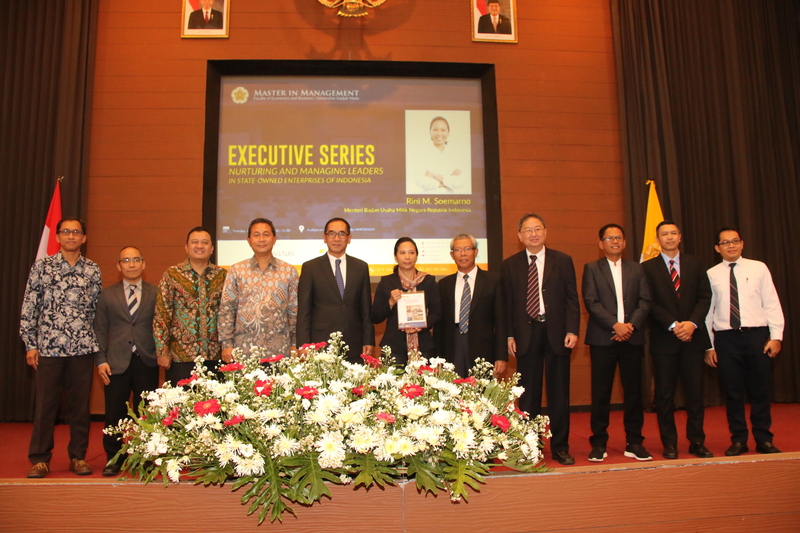 Presenting the theme of “Nurturing and Managing Leaders in State-Owned Enterprises of Indonesia”, Master in Management Faculty of Economics and Business Universitas Gadjah Mada (MM FEB UGM) Yogyakarta held another Executive Series. 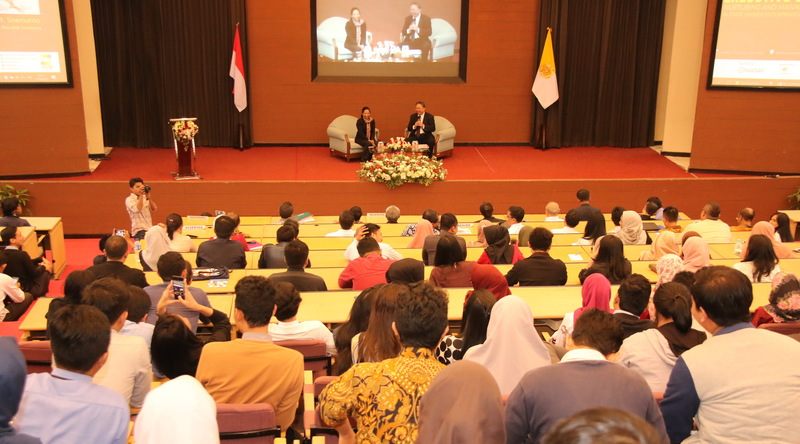 Initiated by Hustler Entrepreneur Club and supported by Master in Management Student Association (MMSA) as the student association in MM FEB UGM, the Executive Series invited Indonesian Minister of State-Owned Entreprise, Rini Mariani Soemarno. Apparently, it was the first time for Rini Soemarno to share her knowledge in front of students in academic environment of a campus. 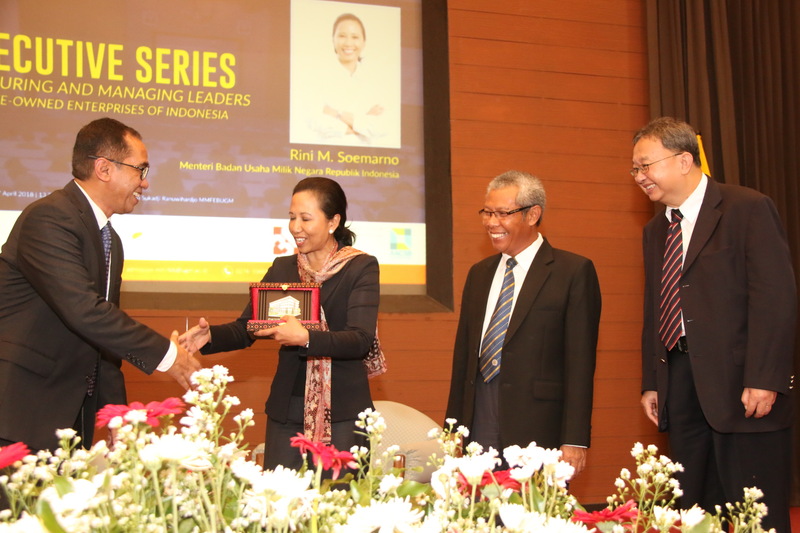 Rini Soemarno, the Indonesian Minister of State-Owned Enterprise in Kerja Cabinet of 2014-2019, was accompanied by Board of Directors of some state-owned enterprise banks. On the other side, the Vice Rector of Collaboration and Alumni UGM, the Dean of FEB UGM, the Board of Directors of MM FEB UGM, and some senior lecturers attended the event. An opening remarks from Dr. Eko Suwardi, M.Sc. 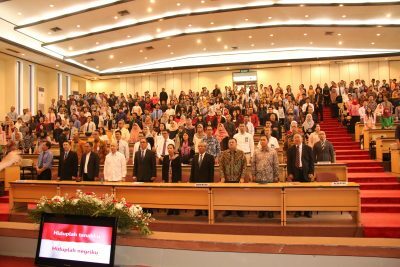 as the Dean of FEB UGM marked the opening of the event on April 12, 2018 in Auditorium Sukadji Ranuwihardjo. “We have a great opportunity where we can learn directly from the Minister experience,” said Eko in front of around 400 students. In his speech, Dr. Paripurna Poerwoko Sugarda, M.Hum., LLM. as the Vice Rector of Collaboration and Alumni UGM recounted the importance of momentum in developing the country which was sustained by the ability and supports from state-owned enterprises. He promoted the opportunity for the students to learn the efforts did by the Minister to gain the Ministry’s success by empowering its human resources since it was believed that in addition to increase the company performance, human resources were also set as the agend of development to improve the society and country. 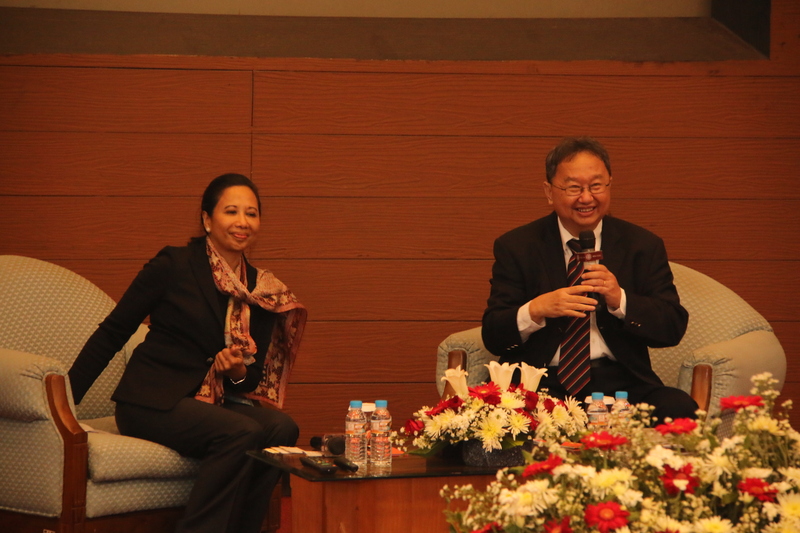 Hani Handoko, M.B.A., Ph.D., the Director of MM FEB UGM, lead the event as the moderator. After being introduced, Rini explained the meaning and action she did during her position as a minister and director in organizations. Challenges and obstacles during her service in the Ministry became the main point of the discussion. Among her explanation, Rini interacted with the students including giving some quizzes and giveaways. In the end of the event, Rini and the officials from the Ministry of State-Owned Enterprise gave another quiz session for the students. Furthermore, the students were excited to have a selfie photo with the guest of the day.